I get asked a lot of wedding questions and a lot of them are really unique and specific to a person's wedding (things like "Can you recommend a non-traditional venue in Southern Alabama?" to "Would you mind critiquing our Save The Date cards before I print them?"). As far as general wedding questions, the one I get asked more than anything is: Who do I get thank you gifts for? My answer: Everyone you can afford to get one for. 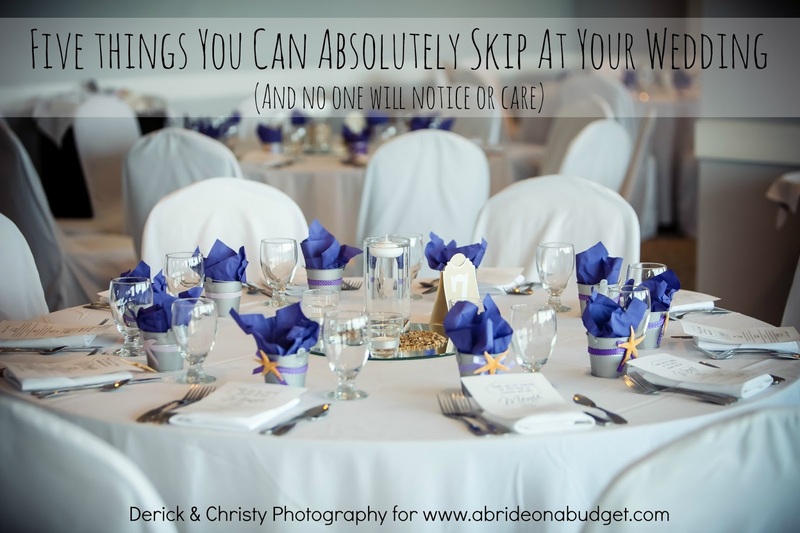 As a general rule, you should get them for (in this order): your maid of honor and best man, the rest of your bridal party (including the ring bearer and flower girl), your parents, your ceremony helpers (readers, Eucharistic Assistants, ushers), and your favorite wedding blogger (okay ... kidding about that last part. Just wanted to see who was actually reading). Thank you gifts, though, they don't have to be expensive, just a token to say you appreciate them. And they don't have to be overly complicated either. This wedding thank you gift idea is really simple. It took me no more than two minutes to put them together. Plus, they were really inexpensive. Since I had two colors of chocolates, I mixed them together. It gives you a better look in the mug. 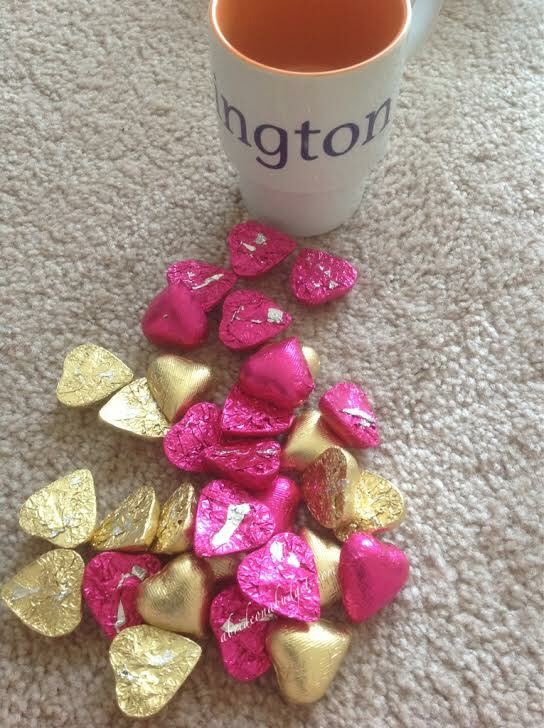 Scoop the chocolates into the mug, stick a Starbucks gift card in the chocolate, done. I told you it was easy. Now, about the Starbucks gift card. Personally, I got our gift cards for free because I used Tango cards from Media Insiders (a mobile app that gives you free gift cards for having it on your phone); the chocolate was actually leftovers I had (if you're doing a candy buffet, just grab a bit of the extras); and the mugs were $32.99 for four. But CafePress has flash discounts basically every day. I purchased these when there was a 40% flash discount, so they were actually only $19.79 for four -- or $4.94 each. So yes, this entire thank you gift, which includes a $5 Starbucks gift card, only cost me $4.94. Can't beat that (well, unless you go to the dollar store and buy dollar store coffee mugs but I love that you can personalize items at CafePress. 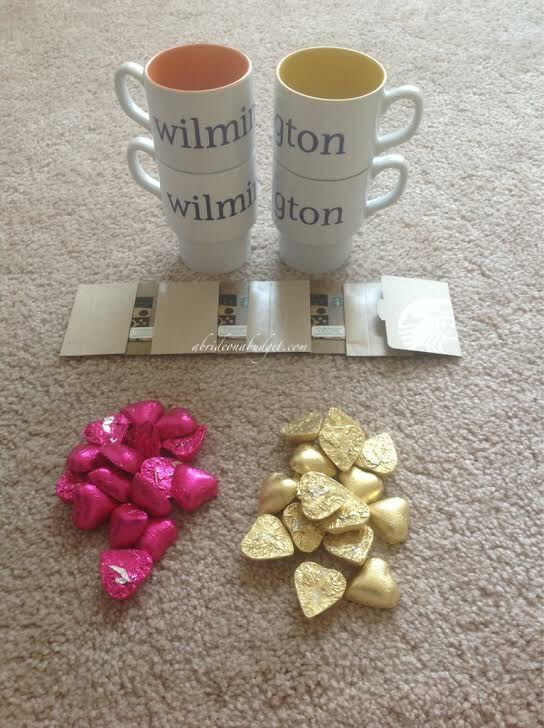 And these mugs say Wilmington on them, which is where we got married so they're special). 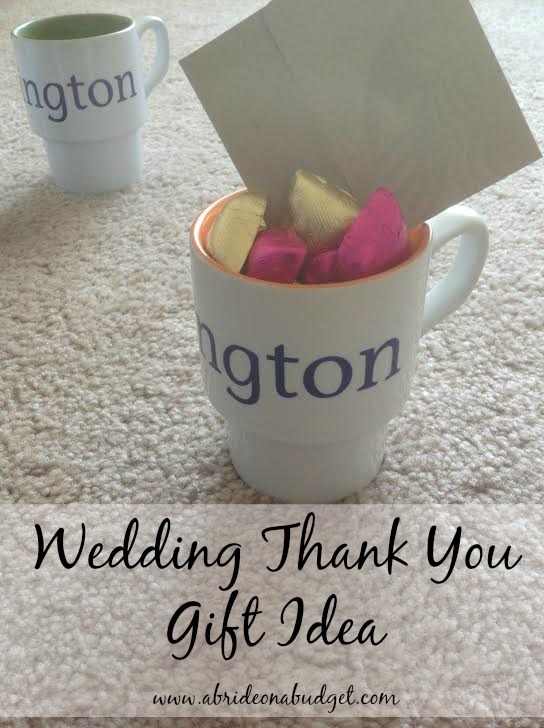 BRIDAL BABBLE: If you made this wedding thank you gift, what would you fill the mugs with? I love how you go into details of your deals! I've heard of the app on your phone where you can get cash back. Thank your, for sharing your tips! Thanks =] I wanted to really break it down for people, in case they wanted to make these themselves. 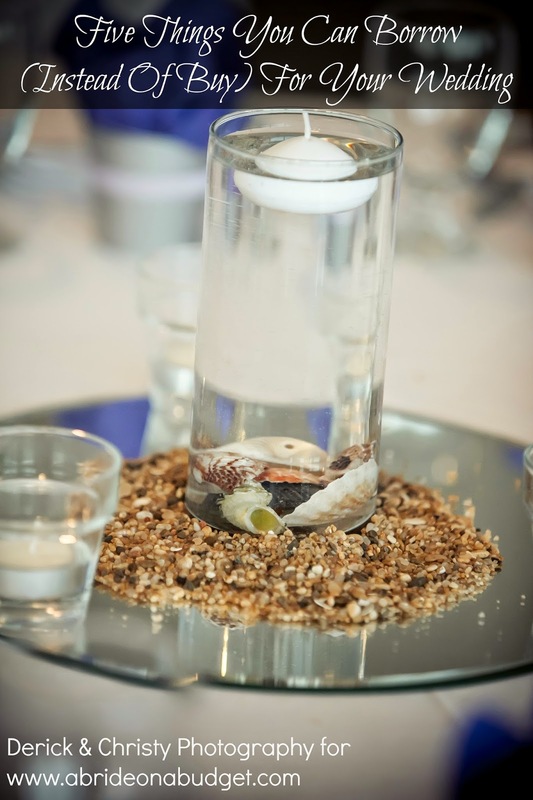 What creativity- where do you come up with your ideas? A lot of ideas stem from me not wanting to throw anything away. So before I toss something, I sit and look at it and try to figure out a DIY project for it. It's really fun! What a cute gift that everyone can use. I agree about you sharing the details of how to get the deals, bonus. 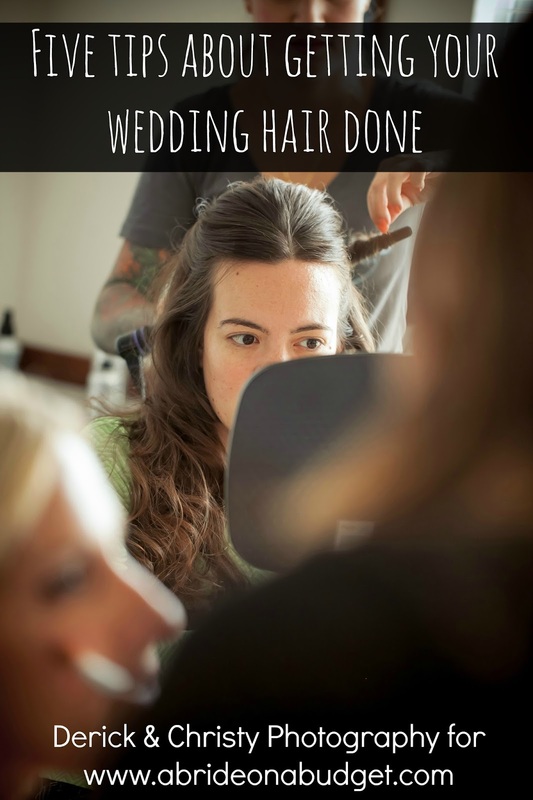 Great tips for a bride or anyone for that matter. Thanks so much! I'm glad you like the gift ... and the details of it! Love the idea of getting cash back on purchases and gift cards are a great idea because everyone can use those. If I did this, I think I would fill the cups with jelly beans. Don't have to worry about them melting. Oh, jelly beans are a great idea -- especially if you have your wedding a bit after Easter. That way, you can get them for 50% off the day after Easter! I love these easy wedding "Thank You" ideas that can be done on a budget! Perfect and memorable. Thanks so much. If you made them, what would you fill them with? I love the simple thank you's. You can incorporate these into other ways of saying Thank You, not just at weddings. Very creative!! That's very true. These would be great as end of the year gifts for teachers too. Great idea Lisa! I love the personalized mug. I think I would fill mine with "Kisses." Going along with your frugal idea, they have them in different wrappers for different holidays. If you wanted red.........buy them after Valentine's Day. If you wanted pastel...........after Easter. Thanks so much for sharing this great idea at Let's Get Real. What a super cute idea, and with all the late nights and early mornings of wedding weekend on top of travel days for many, I bet the coffee is much appreciated!